Canada is sending six CF-18s and military personnel to assist NATO in operations in Eastern Europe, Prime Minister Stephen Harper announced today. The move comes following a request from NATO amid tensions in Eastern Ukraine. 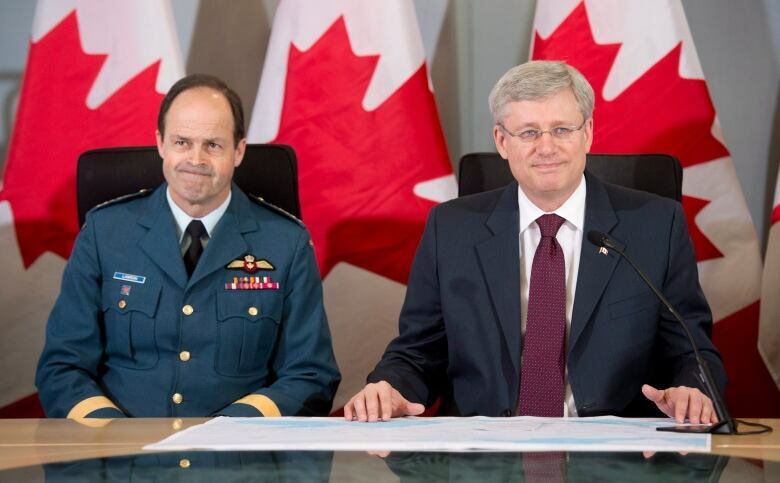 "This is in response to the situation that's developing there, and frankly, more generally to the concern that we have on what really is expansionism and militarism on the part of Russia under the presidency of Mr. Putin," Harper said during a photo op with Gen. Tom Lawson, the chief of Canada's defence staff, and other military leaders in Ottawa. "I believe this to be a long-term serious threat to global peace and security and we're always prepared to work with our allies in NATO and elsewhere to try and bring whatever stability we can to the situation." Sources say Lask, Poland, is being considered as the base for the fighter jets. There is no word on when the assets are to be deployed or whether NATO's plans could change with the Geneva agreement. Foreign Affairs Minister John Baird tweeted cautious support for the agreement late Thursday. "Geneva talks on Ukraine are a step in the right direction, but more needs to be done. #UnitedForUkraine," he tweeted. Sources tell CBC News that the CF-18 commitment is "incremental posturing," meaning there will be a small number of support staff to fly and maintain the planes. Canada will also provide a contingent of approximately 20 Canadian Armed Forces officers to NATO Supreme Headquarters Allied Powers Europe in the Belgian city of Mons. These officers will be a part of security planning. NATO spokesperson Oana Lungescu welcomed Canada's contribution. “This reflects Alliance solidarity and our determination to ensure Alliance security. Work is underway through military staffs to determine appropriate basing arrangements," Lungescu said in an email. Liberal foreign affairs critic Marc Garneau tweeted, "The (Liberal Party of Canada) fully supports deployment of CF-18s and personnel." Paul Heinbecker, Canada's former ambassador to the United Nations, says this is a prudent response by NATO and Canada. "We kept NATO in (existence) all of these years partly as an insurance policy against the day that the Russians may come back. And the Russians are showing signs of coming back," Heinbecker told the CBC's James Cudmore in a radio interview. "So it's appropriate that NATO be the organization through which we respond to that." On Wednesday, NATO said it would increase its military presence in the region by sending more assets to former Soviet countries. The United States and Britain have contributed fighter jets as a part of NATO's reassurance efforts. "The planes carrying out aerial observation over Baltic states will increase, and allied ships will be shifted to the Baltic Sea, east Mediterranean Sea and the places considered necessary," NATO Secretary General Anders Fogh Rasmussen said on Wednesday. Sources say Canada had considered moving the Royal Canadian Navy ship HMCS Regina from its current counter-terrorism mission in the Arabian Sea to the Mediterranean to be a part of NATO assets in the region. 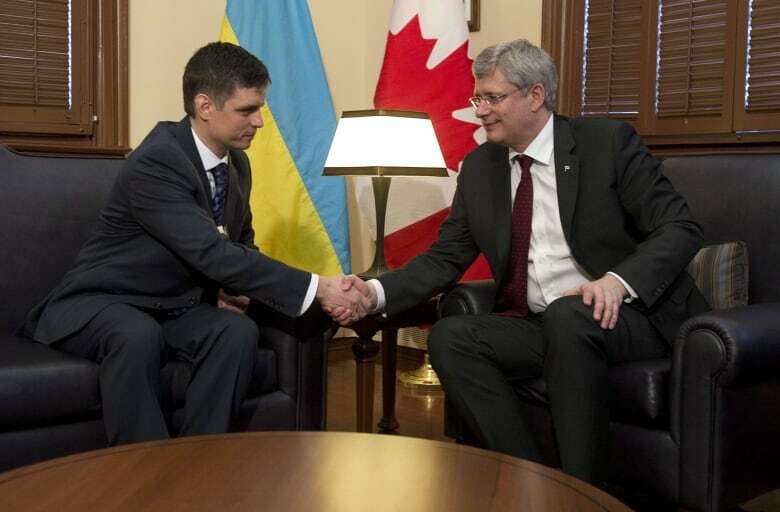 Prime Minister Stephen Harper met with Vadym Prystaiko, the Ukrainian ambassador to Canada, on Monday to discuss the worsening situation in Ukraine. (Adrian Wyld/Canadian Press)​Earlier this week, Harper sat down with MarcinBosacki, the Polish ambassador to Canada​, and envoys from Ukraine, Georgia, Latvia, Estonia and the Czech Republic and condemned Russian "provocateurs" for fomenting unrest in eastern Ukraine. Harper called the regime of Russian President Vladimir Putin "aggressive, militaristic and imperialistic" and a grave threat to world peace. Harper said the situation in Ukraine is getting worse. Canada has already imposed visa bans and sanctions on Russian officials and promised $220 million for restoring economic stability in Ukraine. Foreign Affairs Minister John Baird is in the region next week, with stops in the Czech Republic, Slovakia, Poland, Latvia and Estonia.